Apple’s App Store has been around for almost 5 years. In that time, we’ve seen some pretty incredible breakout work from both indie developers and from big companies. But being a breakout hit on the App Store is getting harder as the store fills with more polished content. An ‘oversight’ role, with input in design, functionality and even some dips into code is becoming more prominent and I think more important. As projects increase in maturity, complexity and profile, it seems that having a person with design and functionality sensibilities who can take on a higher vantage point will lead to more success. I’ve been talking to a lot of folks about the idea of an ‘App Director’ role and its prominence in successful studios and projects. The concept is bigger than that of a project manager, who’s really about assigning tasks, but it’s also not the indie app developer and designer who’s doing it all themselves. I think of the App Director as more of an auteur because they’re realizing a vision like the director of a film. They may not wield the camera or the sound boom, but they’re still making their vision real. An App Director may have the technical knowledge or even raw talent to do both design and coding work, but they might not necessarily do either. This isn’t to diminish those with coding/design/business savvy that work on small 1-2 person teams, but I think that those projects will exist alongside bigger ideas that need a producer or director to make them work. I’ve been talking to some people who I think are in those roles and some who are crafting a new breed of tool that could be uniquely useful to these kinds of ‘directors’ in helping them to realize their vision. Chris Harris is the Head of Mobile at the OTHER media, a UK design and development house. Among other things, they’re responsible for Brian Cox’s Wonders of the Universe, which was recently featured in an Apple iPad ad and won numerous multimedia awards and the Times Atlas, one of Apple’s best apps of 2012. Harris says that it’s not always easy explaining exactly what it is he does. The title of an ‘App Director’ does more than just make it easier to answer awkward questions though. Harris says that it also helps him to establish his role as a peer when dealing with clients. Despite the term used for clients, Harris still says that he prefers to think of the role as somewhat more of a producer than a director. “I have to deal with incredibly complex corporate politics, feature request lists and strong personalities. You tend to need all the help you can get,” he says. Defining your role as a director taps into a long tradition of film and television, helping to quickly communicate that you’re not a silent partner in the app design game, you’re also someone with a vision that you’ll execute using the tools you have. In the case of apps that can be equally talented programmers and designers working with you. But the overall vision is one that a director is going to execute according to their own tastes. “I can only speak for myself,” says Harris, “but I really feel that what I do is art. There are many ways to solve interface design problems but, like a film director, an App director will have a particular style that you seek out and employ them for. Impending’s Phill Ryu sees the increased App Store competition as incentive to pool resources, rather than to attack code and design single-handedly. He believes that the stakes on the App Store and the sheer number of apps is going to lend strength to projects that have a strong vision and leadership role. Smaller teams may end up seeing more value in specialization and less in ‘soup-to-nuts’ beginning to end development by a single developer. The role is no easier to define for Ryu, even after involvement in a string of high-profile apps like The Heist and to-do app Clear. “The position is kind of intangible and much harder to clearly describe than bringing on ‘x’ designer or whatever, and there’s some mistrust there,” he says. And as the concept of the App Director has risen in popularity, so has the market for tools that help these directors to communicate in the proper languages for designers and coders. “It’s difficult using the current set of tools for 3D OpenGL projects since they predominantly deal with two dimensional screen based designs,” says Harris. Paper is great, especially for those directors who may already have some design taken, or at least the ability to render those designs well on an iPad. But there has also been a move towards bespoke tools for rapid prototyping, like the iPhone app POP. We’ve covered POP before, and found it to be a brilliant execution on the RP model for app mockups. 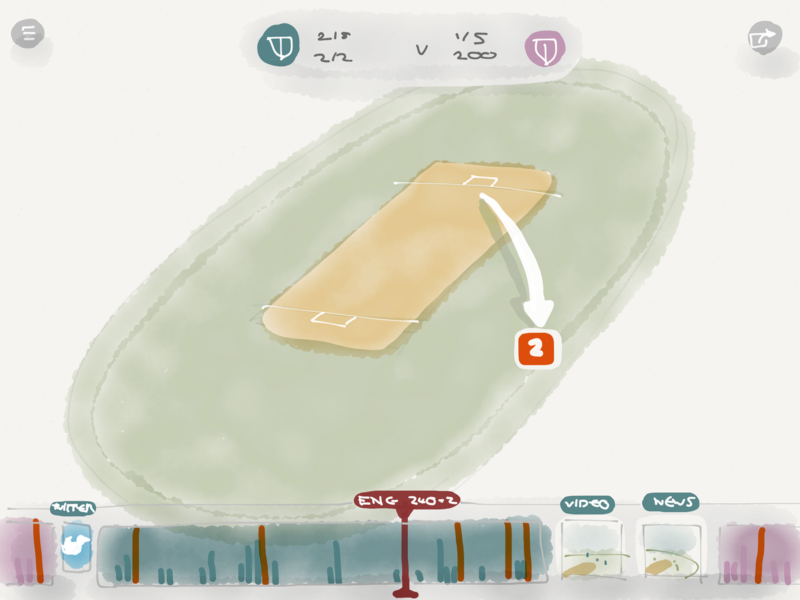 Sketch an idea on paper and shoot an image, and you’re presented with an image that you can add actions to and link to other images in your app’s flow. Hooking several images together can help you to whip together a somewhat crude but ‘live’ model for an app. But what happens as the needs of a director get more complex and refined? How do you convey a vision with precision and specificity? That’s the question MartianCraft’s Rob Rhyne asked himself in 2009, when a group of potential investors and they wanted a tech demo. “In 2009 I had a bunch of ideas, but I couldn’t get them going, so I used my programmer’s brain to build something to more easily demonstrate the idea of what I wanted to do,” says Rhyne. That was the genesis of Briefs 2, a Mac app and its Briefscase iOS viewer that is allowing people outside of the design field to create interactive ‘briefs’ or mockups. Those mockups can then be distributed to anyone using the free Briefscase. Rhyne gave a talk at C4 about a framework that allowed people to script out an app mockup in a text file and ‘compile’ it on iOS. When he had trouble getting the app approved by Apple, he set it aside for two years. It wasn’t until WWDC last year when Rhyne ‘assigned’ the project to his own company MartianCraft, which he runs with Jeff LaMarche. “It’s the easiest business paperwork I ever had to sign,” jokes Rhyne. An Apple evangelist told Rhyne at the time that if it was ‘more like a document’ that was created by a Mac editor, then there was a good chance it would make it through. In the end, the delay and the rejection made the app better, and Rhyne says that Apple was not only communicative but also helped them iron out some serious bugs once Briefs 2 was born. And it also made it a better app for its intended audience. “Designers are visual people, and I was building a framework for designers that required them to code,” says Rhyne. 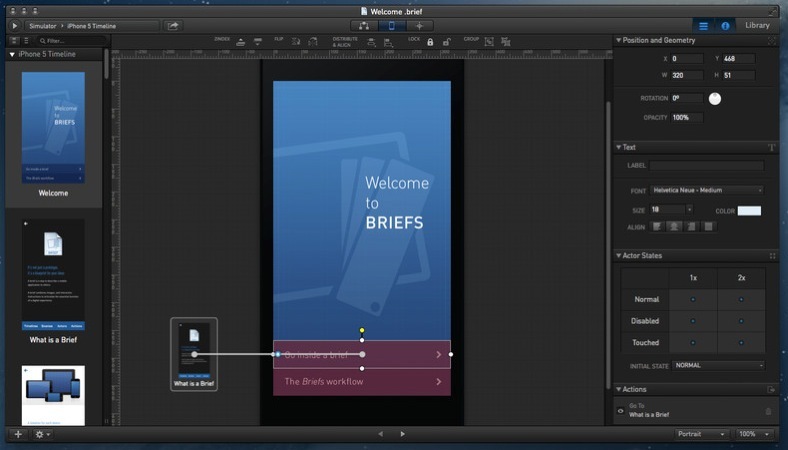 Briefs is a tool that lets someone with an idea mock them up and refine them over time. Starting with something that’s very ‘sketch-like’ in nature, but grows in polish and will even accommodate production-level artwork as the design gets finalized. Though Rhyne is a coder, he says that his role is significantly different these days. At this point, the title of App Director isn’t formalized in many circles, but it’s beginning to be. I’ve been talking with developers, designers and others in the field and they’re getting more comfortable with the idea of being an ‘impresario’. In some ways this is still an evolution of a ‘project manager’, but it’s been fused with the idea of an independent developer without any mothership to answer to. But it’s also more than that. The expectations of the App Store and its clientele are higher than ever. Great design, crisp code and a brilliant idea well executed are all needed to even hand in your ticket at the door to the game. He apologizes for rambling but I feel that’s fairly astute. Even those outside of the development game are seeing that successes are coming harder for smaller apps. Yes, there will still be those crazy breakout hits from sole artists. But it’s seeming increasingly likely that the best stuff on the App Store will be coming from storytellers, using the app as a medium.